Summer brings with it days at the beach, fireworks and freezies, sunburns and sunglasses, and cases of fresh fruit ready to be canned. I grew up watching my mom can fruit as it came in season and on sale. Now, I’m the one stocking up on Bernardin jars and watching for the next variety of fruit to hit my local fruit stand. If you’ve never done home canning before, here are 5 reasons why you should consider trying it this summer. 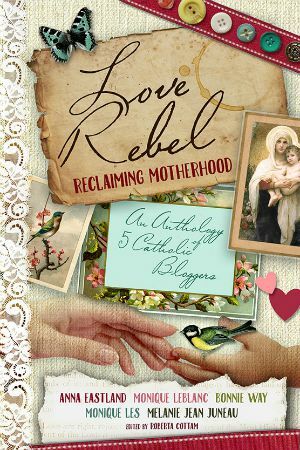 I have partnered with YMC and Bernardin and have received compensation for this post. All opinions are my own. My memories of my mom canning involved her spending all day in the kitchen, preparing and processing fruit in huge batches. (She was feeding two teenage boys.) 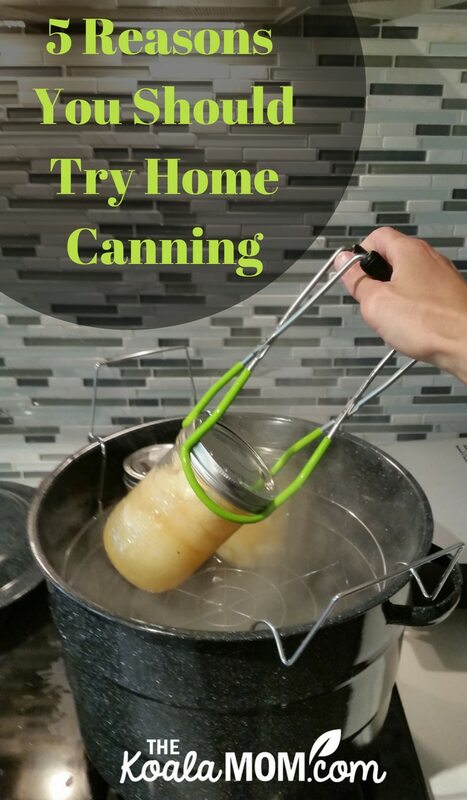 Because of that, I thought canning was a lot of work and was reluctant to try it for years. Bernardin makes canning easy for the beginner with their Home Canning Starter Kit. This box contains everything you need to get started—a large pot, a DVD with tips and recipes, two sizes of jars, and all the tools. As you do more canning, you can add more jars to your collection. The box also makes it easy to store all your canning supplies when you’re not canning. The Bernardin Home Canning Starter Kit includes a DVD with a demonstration on making strawberry jam. One of the Bernardin chefs shares some easy but important tips for canning jam. (I didn’t know you should crush berries by hand rather than using a food processor—watch the DVD to find out why!) The DVD comes with a booklet of recipes for jams, salsa, and pickles. If home canning still seems a bit daunting, start with berries. Blackberries, raspberries and blueberries just need to be washed and placed in jars. Cherries are also easy to can as they simply need pitting; get a cherry pitter and your kids will be fighting over who gets to help. This was what motivated me to start canning. I saw a huge case of pears at our local fruit stand for a great price, and bought it—then called my mom to ask how to can pears. During the summer, fresh fruit is in season and on sale. You can often find cases of pears, peaches, cherries and other fruits for great prices. Here in BC, we’re surrounded by local orchards so it’s easy to stock up when each fruit is in season. You can also visit local U-Picks to get your fruit even cheaper. If you have access to your own fruits and vegetables, canning becomes even more cost effective. When I was growing up, my mom preserved applesauce, apple pie filling, and apple jelly from our own apples; raspberries, raspberry jam, saskatoon jam, and nan king cherry jelly from our bushes; and beet, bean and cucumber pickles from our garden. My mother-in-law makes strawberry rhubarb jam every summer with her rhubarb (when strawberries are on sale) and gives it to each of her children for Christmas. Once you’ve bought your canning supplies, you’re set for years to come. If you gift your canned goods, ask for the jars back when they are empty. 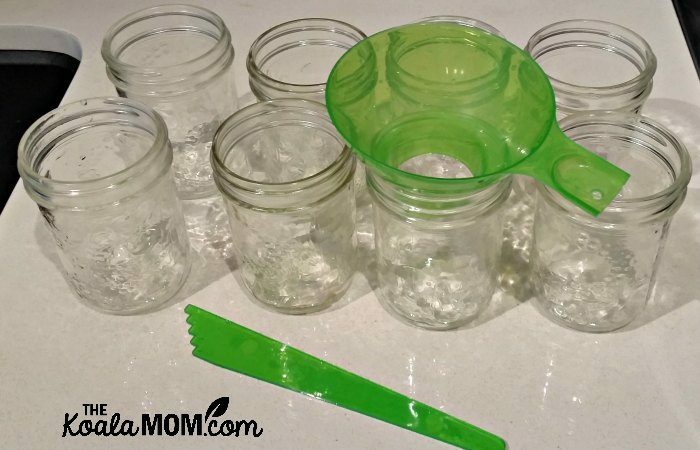 Wash and store your own jars after eating the fruit so you’re ready for the next canning season. One big reason my mom canned so much every year was to accommodate my younger brother’s special diet. She preserved all our food sugar-free for him, including ketchup, pickles, jams and more. Canning your own food lets you meet special dietary needs without blowing the budget or sacrificing taste. Like my mom, I still can most of my fruit and jam with honey or less sugar. See the Bernardin website for some tasty low-sugar recipes. You can also reduce salt in your home canning and can without the preservatives commonly found in store-bought sauces like Oriental Plum Sauce. Canning is a fun way to get creative in the kitchen. There are tons of great recipes for canned goods that you can’t find in the store. My cousin makes brandied peaches that are absolutely amazing. She also likes making chutney and antipasto. Involve your kids! I have fond memories of canning with my mom (okay, mostly I enjoyed snacking on the peelings while preparing the fruit!). I also liked making pretty labels for the jars when Mom was done canning. When I’m in the kitchen, my girls always want to help out. Kids can wash fruit and peel or chop it. 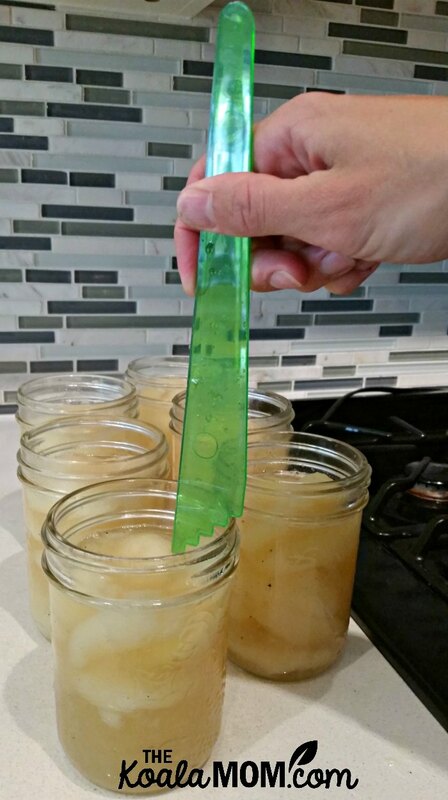 With the handy jar lid lifter (aka “magic wand”) from the Bernardin Home Canning Starter Kit, your child can put the lids on the jars for you. Kids can also check head space as you fill the jars. Can with a friend! You could each get a case of fruit and your own jars, and get together to do the work. You’ll have plenty of time to chat while preparing the fruit and waiting for it to process. Plus, it’s easier to can bigger batches while you have a friend to help manage all the different steps. When my husband saw me with my first case of pears and box of jars, he looked at me as if I’d lost my marbles. Why would I go to all this work to can something I could just buy on sale? I said, “Wait and see.” And sure enough, the results were proof for him. Home canned fruit is much better than any commercially processed fruit. This is because you can pick the fruit while it’s ripe and perfect, and process it immediately to capture all that sweetness and flavour. Canned pears taste green and crunchy to me, while home canned pears are soft and sweet. Canning also lets you get creative with fun recipes. There are tons of recipes online (just search Pinterest!). You can also subscribe to the Bernardin email newsletter to get delicious recipes emailed to you every week, like the Apple Ginger Chutney or the Spiced Honey (that would be great for adding to tea when I have a cold!). Ready to start home canning? You can find the Bernardin Home Canning Starter Kit and anything else you need to start canning at your local Canadian Tire or Walmart. 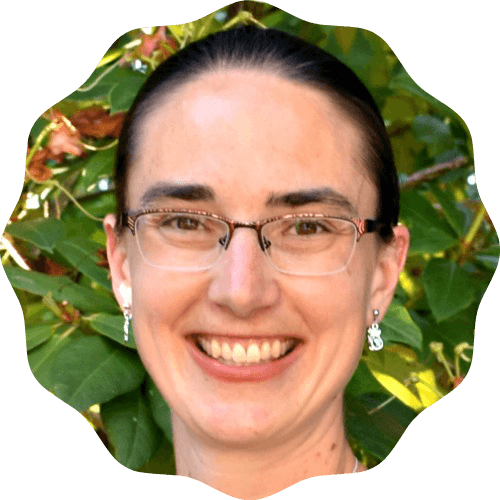 I’ve also seen Bernardin jars and pectin in the baking aisle at my local grocery store. For more tips and ideas about home canning, drop by the Bernardin website. You can also follow them on Facebook, Twitter and Instagram. 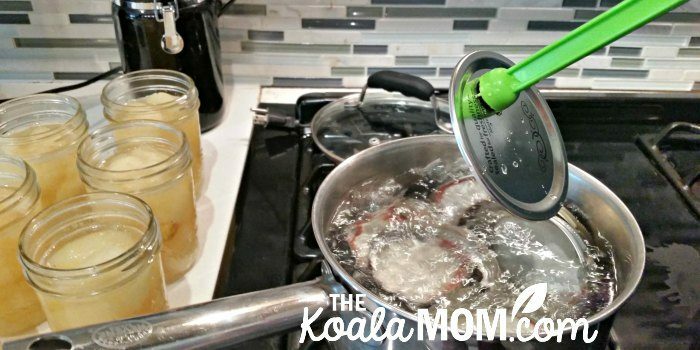 Have you tried home canning? What tips would you share for getting started? What’s your favourite fruit or vegetable to can? My mom and grandma used to Can. it always looked like so much fun! I might consider getting into it myself one of these days! Thanks for sharing! Looks fun! and delicious! enough for me to want to give it a try! Thanks for the encouragment!